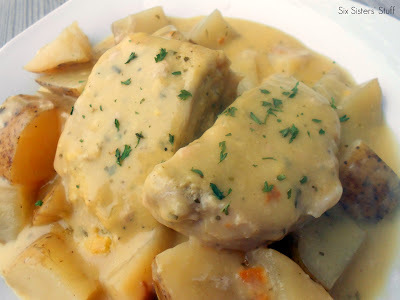 Lay chops in casserole. Cover with sauce. Bake at 350 degree F for one hour. Spray your slow cooker with non-stick cooking spray and place the pork chops inside. Mix together the condensed soups, Ranch dressing mix and milk. Pour on top of the pork chops and cook on LOW for 6-7 hours or on HIGH for 4 hours. Use the extra sauce in the slow cooker as a gravy and serve over mashed potatoes.